L2L has tagged me with this really fun bag tag! You really should check out her blog. I'd never been there before, but it's going on my must read list. 2) I want to know how much it cost:) And this is not to judge, because I’m honestly telling you I was ready to put down some cash; I just got lucky. This is for entertainment purposes only. So spill it. And if there is a story to go along with how you obtained it, I’d love to hear it. So, here is my bag, actually I carry two. The huge one is for mega grocery shopping trips, as my Couponizer will not fit in my other bag. I paid $9.99 for this bag at least 5 years ago at Walmart. The small bag is the one I use for all quick trips and is honestly my preferred bag. I've only had it a few months, I snatched it up for $1 at a yard sale. Now it's time to tag some chicks! Lenore, Gina, Christine, and Wep...show us your bags! i love your bags and will be posting soon. Very cool! I especially like the top one... 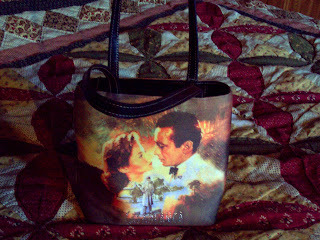 I have a "Gone With the Wind" purse that I always get plenty of compliments on! 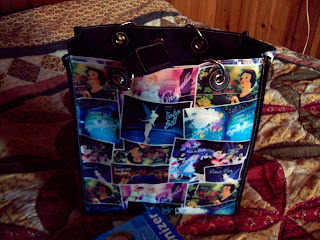 My daughter would flip if she saw your princess bag. Having two brothers has made her quite the princess in training, lol. Thanks for playing along and the love!!!! !